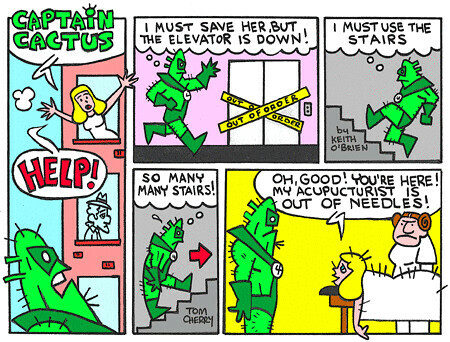 A Captain Cactus comic by Keith O'Brien (Writer, layouts, and Cap's creator) and Tom Cherry (That's me, of course! I drew it!). A picture of yours truly made the front page of The News-Gazette (8/25/15). Winchester's newspaper of record has always been kind to the radio show! Thanks to Bill Richmond for the photograph and for coming to the show. Shellfish and Proud of It! Grab those pencils! Sharpen those crayons! Upset that inkwell! It's time to get crabby! In honor of Patrick McDonnell's crusty crustacean, September 19, 2015 is "Draw Crabby Day"! Patrick McDonnell is the creator of the wonderful comic strip, Mutts. Just a quick sketch I did at work today. Ancient warrior? A pharaoh from the past? Some dude with long hair? You decide! We had another fun radio show this Saturday! Thanks to all the kind folks in our audience (All mighty cue card thespians!) and to this month's wonderful cast (Happiness is when talented actors are also your friends!) for continuing to make the fourth Saturday the best day of the month! We'll be back on September 26 with more mirth, merriment, and Hoppy Hopper! Radio fun for everyone! 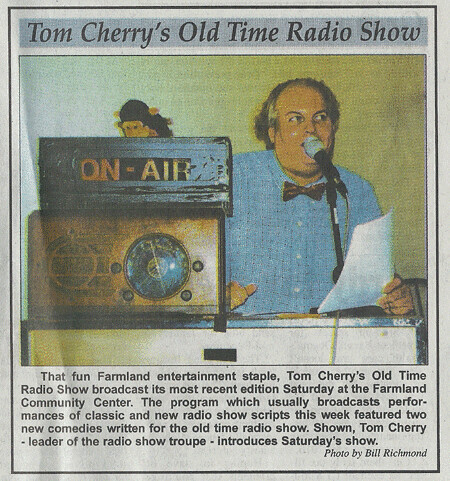 Tom Cherry’s Old Time Radio Show is proud to present two new original programs to our ever expanding line-up! Off the Rails with Zed and the Bookman and The King of Farmland will debut at the Farmland Community Center August 22nd at 3:00 pm! Our talented cast includes Wendy Carpenter, Sean Orlosky, Gabe Carpenter, Bob Green, Missy Donahue, Katy Wolfe, soundman and soundwoman, Jerry and Judy Cole, and special guest stars, Rita Wessel and Joe Skeen! Plus a lucky contestant will play It Pays to be Ignorant and the musical talents of Missy Donahue, Katy Wolfe, and Rita Wessel will be featured! That's August 22nd at 3:00 pm at the Farmland Community Center (100 N. Main St, Farmland, Indiana)! Tickets are just a dollar! Popcorn and refreshments will be available for purchase. I'm trying to learn how to draw Dale Martin's character, Stilts. This is how I write scripts sometimes. These are for a new radio script for Off the Rails with Zed and the Bookman. Who Needs Chorus Line When You Have This Fish on the Line? Came up with an idea for a musical version of Jaws this weekend. Everyone sings. Even the dismembered head in the sunken boat ("I ran into a shark/That teared me apart/And my head has never been the same!") Quint also sings as he gets devoured ("I'm going down/In this shark's terrible frown/Don't hand me a life jacket, Chiefy"). Any angels out there that want to support this soon-to-be classic musical? Think, Dog! is teaming up with Valhalla on opening night for a special evening of entertainment on September 11, 2015. Musical guests and a silent art auction will precede the performance of The Guys, a short play by Anne Nelson. All proceeds from all shows will go to benefit our Muncie firefighters and first responders. We'd like to thank especially Mayor Dennis Tyler and Muncie Professional Firefighters Local 1348 for helping us secure the rights for this powerful show. The Guys is set in the weeks following September 11, 2001. It tells the story of two people struggling to express grief and compassion in the midst of catastrophe. The Chicago Tribune called it "a small jewel of a play." We're thrilled to welcome guest director Tony Robinson, a guy who's done a little bit of everything in entertainment, from writing to radio to stand-up. Welcome also to Tom Cherry and Katy Wolfe; new to our stage but not to our theater community! This weekend I worked on a Captain Cactus comic for Cap's creator, Keith O'Brien, and I also penciled and inked a new Oh! Those Savages comic strip. Hopefully, I'll post the strip before the end of the week. While housesitting for some friends this weekend, I was horrified to see their hen eat some cat food. Why? The cat food contained chicken meat. Yes, Tiny the chicken is a cannibal! All she needs now is a chainsaw and she could have her own horror movie franchise. Perhaps John Oak Dalton could write it. Worked ten hours at work today with more chances for overtime this week. Extra money always makes me happy! Looks like I'll be learning the tango the next week or two. It's all for the play I'm currently in, The Guys.